Modi has pledged to strengthen India’s hard power capabilities, but his track record of enacting the economic reforms and national security policy to make good on this promise has been mixed. This pessimism in the run-up to Modi’s election was often punctuated by apprehension. Modi previously had been refused a visa to the United States owing to alleged tacit involvement in religious riots in Gujarat in 2002; in addition, he counted Ajit Doval as a close adviser—a former intelligence chief, Pakistan hawk, and the founder of a leading Hindu nationalist think tank. Many observers wondered if Modi’s foreign policy would be fundamentally inward-looking and nativist, shaped by the stark worldview of Rashtriya Swayamsevak Sangh (RSS) ideologues like Vinayak Savarkar. Would his election significantly stress India-Pakistan relations? Would his (often self-promoted) image as a Hindu strongman hurt India’s ties with the liberal states of Europe and with the United States under then president Barack Obama? Soon after his election, it became clear that Modi would enthusiastically engage with the world and seek to propel India toward more of a global leadership role. Early on, his government announced that it would transform India into a “leading power.”2 Many commentators went as far as to claim that Modi would significantly alter the very contours that shape Indian foreign policy.3 In a 2015 speech, Doval, who became Modi’s national security adviser, noted that India had to “increase [its] weight and punch proportionately.”4 He framed statecraft as “the battle of civilisations, battle of cultures, basically the battle of minds.”5 Both statements alluded to an Indian strategic posture driven by the pursuit of national strength and international prestige, a vision that sought to restore India’s civilizational glory and rightfully secure the country a more prominent place in the international system. Such assertions aligned with the foreign policy views of early Hindu nationalist thinkers. Abhijnan Rej is a New Delhi–based analyst. His current research focuses on Indian foreign policy and defense. Despite this rhetoric, five years later, the prime minister has largely highlighted advances set in motion by his predecessors. The picture that emerges around a presumed Modi doctrine is that of inertia tempered by a few distinct innovations. Especially compared to former prime minister Atal Bihari Vajpayee, Modi has failed to significantly enhance India’s capabilities in terms of increasing the country’s latent power by advancing substantive economic reforms or channeling that power toward bolstering India’s defense capabilities. Insofar as Modi has emphasized the role of force (which enjoys a privileged place in Hindu nationalist thinking), he has done so to bolster India’s self-image, as well as to placate his constituents with an eye toward domestic politics. Absent the cultivation of strength, Modi’s vigorous and pragmatic outreach to other countries around the world and his emphasis on civilizational values as a driver of Indian foreign policy ring hollow, privileging optics over substance. Hindu nationalist thinking about India’s place in the world can be divided into two broad phases: when Hindu nationalist politicians were on the fringes of the country’s political landscape and thus consigned to merely theorizing about foreign policy (from India’s independence in 1947 to 1997), as opposed to the periods when they have assumed power and have been in a position to actively shape Indian grand strategy under two BJP-led governments (from 1998 to 2004 and from 2014 to 2019). These disparate diagnoses led to very different conclusions. Convinced that the materialistic and individualistic form of modernity unfolding in the West would weaken rather than strengthen Indian social bonds, Vivekananda advised that religion is the means by which to bind together an otherwise bafflingly diverse society. Chatterjee, by contrast, advised Hindus to do whatever was necessary to succeed in a dog-eat-dog world; much to the chagrin of conservatives, he commended the consumption of wine and beef should these prove essential to success in battle. By 1947, the difference between these intellectual currents had sharpened, as Indian observers were alternately repelled or impressed by the muscular forms of nationalism emerging in Europe and Asia (and in Japan and China, in particular). The Vivekananda-like reaction was epitomized by Indian leader Mohandas Gandhi who denounced modern civilization as self-destructive and instead preached ahimsa (nonviolence).7 On the opposite end of the spectrum stood Savarkar, who denounced Gandhi as dangerously naive and called on Hindus to acknowledge that great power politics is violent and competitive. Absent the cultivation of strength, Modi’s vigorous and pragmatic outreach to other countries around the world and his emphasis on civilizational values as a driver of Indian foreign policy ring hollow, privileging optics over substance. Following India’s successful bid for independence in 1947, and with the onset of the Cold War, Indian political figures were compelled to translate their ideas into practice. The Indian National Congress (or Congress Party) under prime minister Jawaharlal Nehru advocated a two-pronged approach to international politics focused on nonalignment and nonviolence. Coalescing under the banner of the Bharatiya Jana Sangh (BJS), the predecessor of the BJP, Hindu nationalists found it hard to reconcile their two very different intellectual traditions. Under Syama Prasad Mookerjee and especially Deen Dayal Upadhyay, the BJS opposed the Congress Party by insisting that India ought to pursue profitable alliances and rapidly develop its military capabilities. But these BJS leaders could never quite free themselves from their worries that modernity would loosen the only bond that unified Hindus, namely, their religion. Hence, they espoused economic and social policies that sought to protect social stability and moral values rather than foster rapid growth and development. This commingling led the BJS, and subsequently the BJP, to blow hot and cold when it came to India’s capabilities and the prospect of alliances. In the wake of international crises, most noticeably the 1962 Sino-Indian War and the 1991 collapse of the Soviet Union (the latter of which left India bereft of its main security guarantor), many Hindu nationalists called for massive investment in India’s defense capabilities and urged the Indian government to leverage bilateral relations with strong economic and military powers such as France, Israel, Japan, and the United States. Yet the Hindu nationalists never explained how their economic and social policies, especially their hostility to foreign capital and technological progress, would generate the economic gains required to make good on these goals, much less make India an attractive partner. Sitting in the opposition benches, the BJS (and later the BJP) were never compelled to take responsibility for their views. Thus, even as late as 1994, leading Hindu nationalists were, for example, simultaneously calling for the development of a nuclear deterrent to counter U.S. hegemony even as they opposed badly needed foreign investment. The evasiveness that had characterized the BJP’s foreign policy positions during the Cold War could not be sustained once the party finally came to power for an extended period for the first time under Vajpayee, who served for two brief stints in 1996 and 1998 before serving out a full five-year term from 1999 to 2004. Examining his strategic record with the benefit of hindsight, it becomes evident that he displayed a unique mixture of resolve and restraint—a focus on hard capabilities that was nonetheless tempered by careful statecraft and pragmatic diplomatic outreach. Three specific instances demonstrate how Vajpayee’s national security and foreign policy strategy were markedly different from those of the Congress Party prime ministers beginning with Nehru. Rahul Sagar is global network associate professor of political science at New York University (NYU) Abu Dhabi and a Washington Square fellow at NYU New York. Vajpayee’s interest in nuclear weapons became clear when he first assumed office in 1996 for an abbreviated, ill-fated thirteen-day term.12 Soon after returning to office in 1998, Vajpayee authorized additional nuclear weapons tests, which were carried out in May of that year. However, his nuclear philosophy, as announced days after the tests, was markedly restrained, as he offered Pakistan an Indian no-first-use pact.13 Vajpayee took two key steps that operationalized this philosophy. First, soon after the tests, he announced a unilateral moratorium on further nuclear testing. Second, in 1999, India released a draft nuclear doctrine that committed India to an unconditional no-first-use posture and the maintenance of a credible minimum deterrent.14 It is important to note that both ostensible concessions were designed with an ultimately radical intent in mind: to secure India’s entry into the global nuclear order on its own terms. Second, Vajpayee put the role of force front and center in dealing with Pakistan’s intransigence. This mentality became most visible in the prime minister’s resolve to end the 1999 Kargil conflict between India and Pakistan (over the latter’s intrusion into Indian-administered Kashmir) on his own terms, even if that meant significant escalation under the looming shadow of the two country’s nuclear arsenals. The Vajpayee government privately told then U.S. president Bill Clinton that India “would not negotiate [with Pakistan] under the threat of aggression,” implicitly signaling New Delhi’s appetite for escalation.15 Later, in reaction to a failed 2001 attack on the Indian parliament and a severe attack on an Indian military base in 2002—both traced back to Pakistan-supported groups—Vajpayee ordered one of the largest mobilizations of the Indian Army deployed to the Indian-Pakistan border since 1971, although he did not attack Pakistan.16 This approach demonstrated a mixture of resolve and pragmatic restraint. Contrast this approach with the reactions of successive Congress-led governments to terrorist attacks before as well as after Vajpayee’s tenure. In 1993, Mumbai was attacked by a criminal syndicate with backing from Pakistan’s intelligence services.17 The Congress-led government under then prime minister P. V. Narasimha Rao chose not to act against Pakistan despite noting that the attacks were part of “an international conspiracy.”18 Fifteen years later, when Mumbai was struck again by Pakistan-based terrorist elements, the refusal of then prime minister Manmohan Singh to retaliate militarily enforced the still-dominant narrative of a Congress Party that is weak on national security. Yet his outreach to Washington remained pragmatically subordinate to India’s own national interest. While his government offered unconditional support to the U.S. military—including basing and overflight rights—during the 2001 U.S.-led campaign against the Taliban and al-Qaeda, Vajpayee refused to do the same for the 2003 invasion of Iraq, going against the recommendation of his own deputy.20 Autonomy in decisionmaking, the generation of strategic space, and the quest for international multipolarity would remain abiding principles of Vajpayee’s foreign policy agenda. A Hindu nationalist strategic doctrine truly in line with the intellectual movement’s traditional views would emphasize hard power capabilities. As the first BJP prime minister to take the helm since Vajpayee, Modi and his government’s record has been most disappointing on this front, as the prime minister has largely highlighted advances set in motion by his predecessors. Having said that, the Modi government has failed to develop a cogent nuclear strategy that addresses doctrinal challenges emanating from Pakistan’s acquisition of tactical nuclear weapons. Note that while the 2014 BJP campaign manifesto promised to “study in detail India’s nuclear doctrine, and revise and update it, to make it relevant to challenges of current times,”23 Modi thus far has kept the country’s 2003 declaratory nuclear doctrine intact despite speculation to the contrary. There are also no indications that the Indian nuclear arsenal has grown unusually—either in quantity or quality—during his tenure. The Modi government has not adequately cultivated India’s conventional military capabilities either, as efforts to strengthen the country’s armed forces remain hobbled by domestic politics and squabbling among the military’s three branches. Under Modi, in 2018–2019, India’s defense budget fell to just above 1.5 percent of GDP—the lowest such figure since 1962.24 This financial squeeze has accentuated the existing imbalance between money allocated for the procurement of new weapons and the replenishment of old ones and budgeting for the salaries and pensions of military personnel. In addition, Modi has failed to reform India’s lumbering military bureaucracy, which is prone to interservice rivalries. Despite early campaign promises, his government has failed to appoint a chief of defense staff, a precondition to jointness among the Indian military’s three branches. Without a single figure to oversee the three services, someone who would have the legal authority to reprioritize military goals as well as emphasize power projection, India’s army continues to reign over the country’s navy and air force. When the Modi government did set out to reform the country’s national security architecture in 2018, it did so though a series of workarounds that diminished the role of his cabinet and concomitantly emphasized his own office and that of the national security adviser. Meanwhile, a lack of internal cohesion has continued to drain India’s military power. In terms of terrorism emanating from the border with Pakistan, Modi has also achieved few gains in his efforts to deter insurgents and terrorists despite demonstrating the military intent to do so. The more the Indian Army is retooled to serve counterinsurgency functions, the less it is capable of fighting conventional wars. Modi has been unable to make significant progress in resolving the insurgency in Jammu and Kashmir. When he assumed office, Modi took a muscular take-no-prisoners attitude toward the militancy plaguing that state. However, this hardline approach quickly backfired, as popular support for the insurgents steadily grew until the summer of 2016 when the death of a young militant at the hands of Indian security forces nearly brought Indian-administered Kashmir to a halt with intermittent curfews for around one hundred days.27 Vajpayee (and to a lesser extent Singh) made serious attempts to resolve the Kashmir imbroglio. In contrast, no single strategic formula on Kashmir that bears Modi’s imprint has emerged. Similarly, when JeM attacked Indian paramilitary personnel in Pulwama in mid-February 2019, Modi’s decision to retaliate by subsequently targeting terrorist camps in mainland Pakistan signaled resolve. Notably, this was the first time since 1971 that India had used airpower to strike deep into Pakistan (as opposed to Pakistani-occupied Kashmir). However, the Pulwama attack decisively proved that the 2016 cross-LoC strikes were insufficient in deterring terrorist attacks emanating from Pakistan. Furthermore, it is quite likely that Modi’s decision to do so was driven as much by domestic politics as by strategic calculations—given that the Pulwama attacks happened just two months before India’s impending April–May 2019 national election. Whether the Indian airstrikes of February 2019 fundamentally change Pakistan’s posture of supporting terrorism in India remains to be seen. Beyond the issue of wielding hard power to advance India’s national security, Modi’s foreign policy has been broadly congruous with those of his predecessors on the diplomatic front. His policies on China, Pakistan, and the United States—three enduring bilateral focal points of Indian foreign policy—bear this out. Modi’s approach to Pakistan has followed a roughly similar trajectory, blending restraint and resolve. Early in his term, Modi reached out to Islamabad in two striking ways. First, he surprised the international community by inviting then Pakistani prime minister Nawaz Sharif to his swearing-in ceremony in the face of opposition from the BJP’s traditional right-wing Hindu allies.38 Second, in December 2015, he became the second prime minister in more than a decade to visit Pakistan (after Vajpayee’s 2004 trip). Soon after, however, a spate of serious terrorist attacks on Indian military targets in 2016 markedly worsened the two neighbors’ relationship (which is uneasy in the best of times). This downturn culminated in the September 2016 special forces operation India launched inside Pakistan-administered Kashmir as well as the February 2019 airstrikes that Modi ordered on mainland Pakistan. Modi’s outreach to the United States is perhaps the bilateral relationship that most exemplifies Modi’s foreign policy flexibility and pragmatism. Soon after his election, Modi visited the country and addressed thousands of members of the North American Indian diaspora at Madison Square Garden in New York.43 Under Modi’s tenure, Barack Obama became the first American president to be the chief guest at the annual parade celebrating India’s foundation as a constitutional republic in 2015.44 In addition, the Modi government signed two key foundational agreements (in August 2016 and September 2018) to strengthen India-U.S. defense cooperation (an earlier such document had been signed by the Vajpayee government in 2002) and instituted the 2+2 foreign and defense ministers/secretaries dialogue mechanism.45 The signing of these documents represented something of a breakthrough, as many Indian observers feared that they were a pretext for a formal military alliance with the United States. The two countries continue to deepen their commercial defense relationship. Yet Modi has also been cautious at crucial junctions when it comes to the United States, shrewdly prioritizing Indian national interests over putative U.S. concerns. His government has refused to participate in joint freedom-of-navigation operations with the United States in the South China Sea. Despite U.S. President Donald Trump’s repeated exhortations, Modi has also kept India’s footprint in Afghanistan light. Beyond that, New Delhi has continued to engage Tehran over its port projects in Chabahar and resisted American calls to stop purchasing petroleum imports from Iran. And most significantly, despite U.S. misgivings, New Delhi has decided to go ahead with the purchase of the S-400 Triumf anti-aircraft missile system from Russia, which remains India’s largest source of weaponry.46 What is striking about both decisions is that the Indian government made them despite signals from Washington that such moves could potentially attract U.S. secondary sanctions and jeopardize U.S.-India relations. These moves, along with Modi’s very visible outreach to Russian President Vladimir Putin in 2018, illustrate the Indian prime minister’s abiding commitment to “strategic autonomy.”47 In this respect, the overarching theme of Modi’s foreign policy has been the same as his predecessors. Modi has also sought to use India’s rich cultural heritage as a source of pragmatic diplomatic leverage when possible. In 2016, he posited that India’s “strategic intent is shaped by our civilizational ethos of “yatharadwad (realism), sah-astitwaa (co-existence) sah-yog (cooperation), tatha (and) sah-bhagita (partnership).”50 Under Modi, India has increasingly begun to use religious diplomacy, for instance, as a strategic tool for a variety of ends. The innovation of Buddhist diplomacy has become, variously, a tool to keep the Dalai Lama card alive,51 forge ties with Southeast Asia,52 and build bridges with China when needed.53 Similarly, the aforementioned Kartarpur agreement represents a form of religious diplomacy around Sikhism that could help pave the way (at least in a limited sense) for renewed engagement with Pakistan. Modi also has promoted multilateral Indian diplomacy around the issue of climate change.56 In the run-up to the 2015 United Nations Climate Change Conference in Paris, he referred to “sunshine countries” (states lying between the Tropic of Cancer and Tropic of Capricorn) as Suryaputras as a way to help rhetorically promote joint efforts to address the global issue. (In the Sanskrit epic known as the Mahabharata, Suryaputra is another name of Karna, the emblem of virtue.) Yet when all was said and done, the core of India’s position at the climate change conference was a hard-nosed form of exceptionalism, asserting in effect that India (and other developing countries) should have different, lower obligations to address climate change—as newly industrializing states—than historically industrial nations do.57 Yatharadwad (realism) seems to be the civilizational ethos Modi—like Vajpayee before him—has internalized the most in shaping India’s foreign policy. 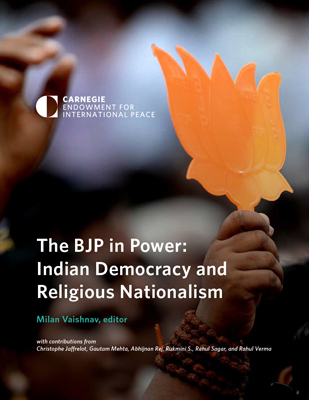 Under Vajpayee, an Indian strategic worldview emerged that cultivated hard-power capabilities, embraced the role of force in international politics, aggressively pursued all dimensions of power, and unsentimentally engaged with other states irrespective of past ideological positions. This approach was in sharp contrast with the diplomatic tendencies of the Congress Party. No such explicitly new worldview has emerged under Modi even as he has pursued a pragmatic strategic policy congruous to Vajpayee’s approach. Modi’s efforts to strengthen India’s capabilities have been middling, marked by the erosion of the latent base of Indian power. While the prime minister’s greatest success has been his vigorous diplomacy with multiple partners, Modi’s efforts to strengthen India’s capabilities have been middling, marked by the erosion of the latent base of Indian power. Without sufficient material strength, such outreach has often rung hollow. On Modi’s watch, India’s military might has continued to decline. Instead of expending his once abundant political capital to rectify the situation, Modi has privileged optics over substance. While he has rhetorically acknowledged the importance of force in international politics, he mostly has done so for ideological reasons and with uncertain strategic effect. That said, his use of civilizational tropes to diplomatically further India’s national interests is a modest innovation that reflects the BJP’s pride in India’s ancient heritage. Whether the BJP’s strategic doctrine can be sustained remains to be seen. There has long been a conundrum at the heart of the Hindu nationalist worldview: its proponents understand that weakness invites aggression and that strength, in turn, depends on building capabilities and cultivating alliances. This reality implies a need to single-mindedly expend political capital on economic reforms that would expand the material base of Indian power—something Modi has failed to do. Consolidating India’s economic strength also means increasing social cohesion, without which India will be caught fighting enemies within, real or imagined. The fate of Indian economic reforms depends to a large extent on India’s openness to the world, especially in terms of access to capital and technology. But because many Hindu nationalists worry about modernity’s social and cultural impact, they are unable to endorse these realities wholeheartedly. As a result, they find themselves, again and again, in the strange position of promising to make India a leading power but actually spending their political capital on initiatives—ranging from the promotion of Vedic science to preventing the consumption of beef—that divide Indians and corrode the very power base that Hindu nationalists imagine will propel India onto the world stage. This is a lesson Modi and his successors must pay heed to in 2019 and beyond. Abhijnan Rej is a New Delhi–based analyst. His current research focuses on Indian foreign policy and defense. He was previously a senior fellow in the Strategic Studies Program at the Observer Research Foundation. Rej’s research and analysis has appeared in Washington Quarterly, War on the Rocks, Interpreter, National Interest (online), and Global Policy (online). He has published more than a dozen occasional papers, briefs, reports, and book chapters, as well as over fifty articles in virtually all major Indian English-language media outlets. Rahul Sagar is global network associate professor of political science at New York University (NYU) Abu Dhabi and a Washington Square fellow at NYU New York. Sagar’s primary research interests are in political theory, political ethics, and public policy. He has written on a range of topics including executive power, moderation, and political realism. He is also deeply interested in the politics and society of India, especially Indian political thought. He is the author of Secrets and Leaks: The Dilemma of State Secrecy (Princeton University Press, 2013). The authors thank Ashley J. Tellis and Milan Vaishnav for comments on an earlier draft of this chapter. 1 C. Raja Mohan, Modi’s World: Expanding India’s Sphere of Influence (Noida: HarperCollins India, 2015), vii. 2 Subrahmanyam Jaishankar, “IISS Fullerton Lecture by Dr. S. Jaishankar, Foreign Secretary in Singapore,” Indian Ministry of External Affairs, July 20, 2015, https://mea.gov.in/Speeches-Statements.htm?dtl/25493/IISS_Fullerton_Lecture_by_Foreign_Secretary_in_Singapore. 3 Anirban Ganguly, Vijay Chauthaiwale, and Uttam Kumar Sinha, eds., The Modi Doctrine: New Paradigms in India’s Foreign Policy (New Delhi: Wisdom Tree, 2016); Sreeram Chaulia, Modi Doctrine: The Foreign Policy of India’s Prime Minister (New Delhi: Bloomsbury India, 2016); and Sinderpal Singh, ed., Modi and the World: (Re)Constructing Indian Foreign Policy (Singapore: World Scientific, 2017). 4 Ajit Doval, “State Security, Statecraft and Conflict of Values,” Lalit Doshi Memorial Lecture, Mumbai, August 4, 2015, http://ldmf.org.in/pdfs/State_Security_Statecraft_and_Conflict_of_Values.pdf. 6 Rahul Sagar, “Hindu Nationalists and the Cold War” in Manu Bhagavan, ed., India and the Cold War (Chapel Hill, North Carolina: University of North Carolina Press, 2019). 7 On Gandhi and foreign policy, see Siddharth Mallavarapu, “Securing India: Gandhian Institutions,” in Kanti Bajpai, Saira Basit, and V. Krishnappa, eds., Indian Grand Strategy: History, Theory, Cases (New Delhi: Routledge, 2014), 258–284. 8 On the opposition of Indira Gandhi’s key aide, P.N. Haksar, to Indian nuclear weapons and even the 1974 peaceful nuclear explosion, see Yogesh Joshi, “Debating the Nuclear Legacy of India and One of Its Cold War Strategists,” War on the Rocks, March 27, 2017, https://warontherocks.com/2017/03/debating-the-nuclear-legacy-of-india-and-one-of-its-great-cold-war-strategists/. 9 “First Nuclear Test at Pokhran in 1974,” Federation of American Scientists, July 4, 2000 (updated), https://fas.org/nuke/guide/india/nuke/first-pix.htm. 10 Ashley J. Tellis, India’s Emerging Nuclear Posture: Between Recessed Deterrent and Ready Arsenal (Santa Monica, CA: RAND Corporation, 2001), 10–11. 11 Feroz H. Khan, Eating Grass: The Making of the Pakistani Bomb (Stanford, CA: Stanford University Press, 2012). 12 Manas Tiwari, “The Story of Pokhran: Tests That Established India as Nuclear Power, Became Cornerstone of Atal Bihari Vajpayee’s Tenure as PM,” Financial Express, August 17, 2018, https://www.financialexpress.com/india-news/the-story-of-pokhran-tests-that-established-india-as-nuclear-power-became-cornerstone-of-atal-bihari-vajpayees-tenure-as-pm/1283660/. 13 Atal Bihari Vajpayee, “Evolution of India's Nuclear Policy,” Lok Sabha Debates, May 27, 1998, https://parliamentofindia.nic.in/ls/lsdeb/ls12/ses2/0527059801.htm. 14 “Vajpayee Rules Out Signing CTBT If Talks Fail,” Rediff.com, October 3, 1998, https://www.rediff.com/news/1998/oct/03bomb.htm; and “Draft Report of National Security Advisory Board on Indian Nuclear Doctrine,” Indian Ministry of External Affairs, August 17, 1999, https://mea.gov.in/in-focus-article.htm?18916/Draft+Report+of+National+Security+Advisory+Board+on+Indian+Nuclear+Doctrine. 15 Bruce Riedel, “American Diplomacy and the 1999 Kargil Summit at Blair House,” in Peter R. Lavoy, ed., Asymmetric Warfare in South Asia: The Causes and the Consequences of the Kargil Conflict (New Delhi: Cambridge University Press, 2014), 136. 16 Walter C. Ladwig III, “A Cold Start for Hot Wars? The Indian Army’s New Limited War Doctrine,” International Security 32, no. 3 (2007/2008): 160. 17 “SC Slams Pak ISI for 1993 Mumbai Blasts, Pak Jumps to Deny Role,” India Today, March 21, 2013, https://www.indiatoday.in/world/pakistan/story/1993-mumbai-blasts-pakistan-denies-role-isi-supreme-court-156722-2013-03-21. 18 Sanjoy Hazarika, “200 Killed as Bombings Sweep Bombay,” New York Times, March 13, 1993, https://www.nytimes.com/1993/03/13/world/200-killed-as-bombings-sweep-bombay.html. 19 Malini Parthasarathy, “India, U.S. Natural Allies: Vajpayee,” Hindu, September 9, 2000, https://www.thehindu.com/2000/09/09/stories/01090005.htm. 20 Devirupa Mitra, “How India Nearly Gave in to US Pressure to Enter the Iraqi Killing Zone,” Wire, July 8, 2016, https://thewire.in/external-affairs/india-nearly-gave-us-pressure-join-iraq-war. 21 Rajat Pandit, “Nuclear Submarine INS Arihant Completes Patrol, Country’s N-Triad Operational,” Times of India, November 6, 2018, https://timesofindia.indiatimes.com/india/as-nuclear-sub-arihant-returns-after-first-deterrence-patrol-indias-nuclear-triad-complete/articleshow/66515624.cms. 22 Rahul Singh, “India Completes Nuclear Triad With INS Arihant’s First Patrol,” Hindustan Times, November 6, 2018, https://www.hindustantimes.com/india-news/fitting-response-to-nuke-blackmail-says-pm-on-ins-arihant-s-first-deterrence-patrol/story-SDGODa4nxf6NfevT5davtJ.html. 23 “Full Text: BJP Manifesto for 2014 Lok Sabha Elections,” News18.com, April 7, 2014, https://www.news18.com/news/politics/full-text-bjp-manifesto-for-2014-lok-sabha-elections-679304.html. 24 Rajat Pandit, “Budget 2018: Govt Hikes Defence Budget by 7.81%, But It’s Just 1.58% of GDP and Lowest Since 1962,” Times of India, February 1, 2018, https://timesofindia.indiatimes.com/india/budget-2018-govt-hikes-defence-budget-by-7-81/articleshow/62740525.cms. 25 Justin Rowlatt, “Why India Wiped Out 86% of Its Cash Overnight,” BBC, November 14, 2016, https://www.bbc.com/news/world-asia-india-37974423. 26 “Rafale Controversy: What You Need to Know About India’s Fighter Jet Deal With France,” DW.com, February 13, 2019, https://www.dw.com/en/rafale-controversy-what-you-need-to-know-about-indias-fighter-jet-deal-with-france/a-47495210. 27 “100 Days of Unrest in Kashmir: Curfew, Pellets, Shutdown and Death,” Scroll.in, October 17, 2016, https://scroll.in/article/819142/100-days-of-unrest-in-kashmir-curfew-pellets-shutdown-and-death. 28 Rahul Sagar, “‘Jiski Lathi, Uski Bhains’: The Hindu Nationalist View of International Politics,” in Kanti Bajpai, Saira Basit, and V. Krishnappa, eds., Indian Grand Strategy: History, Theory, Cases (New Delhi: Routledge, 2014), 247. 29 K.R. Rajeev, “Time for Strategic Restraint Over, Says Ram Madhav,” Times of India, September 18, 2016, https://timesofindia.indiatimes.com/india/Time-for-strategic-restraint-over-says-Ram-Madhav/articleshow/54393643.cms. 30 “UGC Asks Varsities to Celebrate September 29 as ‘Surgical Strike Day,’” Economic Times, September 21, 2018, https://economictimes.indiatimes.com/news/defence/ugc-asks-varsities-to-celebrate-september-29-as-surgical-strike-day/articleshow/65886837.cms; “PM Modi Saw Movie, Gave Thumbs-up to It, Says URI Director Aditya Dhar,” TimesNowNews.com, January 11, 2019, https://www.timesnownews.com/india/article/pm-modi-saw-movie-gave-thumbs-up-to-it-claims-uri-director-aditya-dhar-uri-the-surgical-strike-pm-modi-vicky-kaushal-aditya-dhar-2016-surgical-strikes/345998. 31 “Gujarat, an Investment Hotspot for China, Japan,” Rediff.com, November 13, 2014, https://www.rediff.com/money/report/gujarat-an-investment-hotspot-for-china-japan/20141113.htm; and Shannon Tiezzi, “Why China Embraces Narendra Modi,” Diplomat, May 29, 2014, https://thediplomat.com/2014/05/why-china-embraces-narendra-modi/. 32 Ellen Barry, “With Much at Stake, Chinese Leader Visits India,” New York Times, September 17, 2014, https://www.nytimes.com/2014/09/18/world/asia/much-at-stake-as-xi-jinping-chinese-leader-visits-india.html. 33 “Interview by Mr. Huang Hua, Foreign Minister of the People’s Republic of China, with the Press Trust of India. Peking, February 11, 1979,” in Avtar Singh Bhasin, ed., India-China Relations 1947-2000: A Documentary Study, Volume 5 (New Delhi: Geetika Publishers, 2018), 4,878. 34 Amit Chaturvedi, “Prime Minister Narendra Modi Announces Electronic Visas for Chinese Tourists,” NDTV.com, May 15, 2015, https://www.ndtv.com/india-news/prime-minister-narendra-modi-announces-electronic-visas-for-chinese-tourists-763316. 35 Sergey Radchenko, “The Rise and Fall of Hindi Chini Bhai Bhai,” Foreign Policy, September 18, 2014, https://foreignpolicy.com/2014/09/18/the-rise-and-fall-of-hindi-chini-bhai-bhai/. 36 “Pakistan’s Masood Azhar: China Blocks Bid to Call Militant Terrorist,” BBC, March 14, 2019, https://www.bbc.com/news/world-asia-47565132. 38 “Sena Sulks Over Sharif’s Presence at Swearing-in Ceremony,” Hindu, May 24, 2014, https://www.thehindu.com/news/national/other-states/sena-sulks-over-sharifs-presence-at-swearingin-ceremony/article6044602.ece. 39 “India Should End Indus Waters Treaty with Pakistan: Yashwant Sinha,” Financial Express, September 27, 2016, https://www.financialexpress.com/india-news/india-should-end-indus-waters-treaty-with-pakistan-yashwant-sinha/393781/; and Brahma Chellaney, “Only by Asserting Its Indus Leverage Can India Hope to End Pakistan’s Unconventional War,” Hindustan Times, September 14, 2018, https://www.hindustantimes.com/analysis/only-by-asserting-its-indus-leverage-can-india-hope-to-end-pakistan-s-unconventional-war/story-BHA6ut5HVXBMJa7rYAs8kM.html. 40 “NSA Ajit Doval, Pak Counterpart Janjua Had a ‘Secret’ Meeting in Thailand,” Business Standard, January 1, 2018, https://www.business-standard.com/article/current-affairs/nsa-ajit-doval-pak-counterpart-janjua-had-a-secret-meeting-in-thailand-118010100343_1.html. 41 Shubhajit Roy, “The Long Road From Kartarpur to Peace,” Indian Express, December 2, 2018, https://indianexpress.com/article/india/the-long-road-from-kartarpur-to-peace-india-pakistan-5474399/. 42 “At Cordial Kartarpur Talks, India Seeks Visa-Free Entry for Pilgrims to Pak,” Hindustan Times, March 14, 2019, https://www.hindustantimes.com/india-news/india-pakistan-begin-talks-on-kartarpur-corridor-amid-chill-over-pulwama-attack/story-x89XHPfBCOHNjK08ePdR0I.html. 43 Vivian Lee, “At Madison Square Garden, Chants, Cheers and Roars for Modi,” New York Times, September 28, 2014, https://www.nytimes.com/2014/09/29/nyregion/at-madison-square-garden-chants-cheers-and-roars-for-modi.html. 44 Katie Zezima, “Why Obama’s Trip to India’s Republic Day is a Big Deal,” Washington Post, January 24, 2015, https://www.washingtonpost.com/news/worldviews/wp/2015/01/24/why-obamas-trip-to-indias-republic-day-is-a-big-deal/?noredirect=on&utm_term=.01e21b95a622. 45 “Joint Statement on the Inaugural U.S.-India 2+2 Ministerial Dialogue,” U.S. Department of State, press release, September 6, 2018, https://www.state.gov/r/pa/prs/ps/2018/09/285729.htm. 46 Pieter D. Wezeman, Aude Fleurant, Alexandra Kuimova, Nan Tian, and Siemon T. Wezeman, “SIPRI Fact Sheet: Trends in International Arms Transfers, 2017,” 2018, 6, https://www.sipri.org/sites/default/files/2018-03/fssipri_at2017_0.pdf. 47 For a reaffirmation of India’s commitment to this notion, see the current Indian foreign secretary’s speech at the 2019 Raisina Dialogue: Dipanjan Ray Chaudhury, “Will Pursue Strategic Autonomy Policy, Says Foreign Secretary,” Economic Times, January 11, 2019, https://economictimes.indiatimes.com/news/politics-and-nation/will-pursue-strategic-autonomy-policy-says-foreign-secretary/articleshow/67480579.cms. 48 Moushumi Das Gupta, “Brics Summit: Govt Plans Massive Public Outreach With 90 Events,” Hindustan Times, July 21, 2016, https://www.hindustantimes.com/india-news/brics-summit-govt-plans-massive-public-outreach-with-90-events/story-jcUFnU09ZPqB2YgXm9V38K.html. 49 Prime Minister Atal Bihari Vajpayee, “Address by Shri Atal Bihari Vajpayee,” Asia Society, New York, September 7, 2000, https://asiasociety.org/address-shri-atal-bihari-vajpayee. 50 Prime Minister Narendra Modi, “Inaugural Address by Prime Minister at Second Raisina Dialogue, New Delhi,” Indian Ministry of External Affairs, January 17, 2017, https://mea.gov.in/Speeches-Statements.htm?dtl/27948/Inaugural_Address_by_Prime_Minister_at_Second_Raisina_Dialogue_New_Delhi_January_17_2017. 51 India admitted the Dalai Lama to the country in 1959 much to Chinese anger. While New Delhi recognizes the Tibetan Autonomous Region as a legitimate part of China, by continuing to shelter and support the Dalai Lama, India has implicitly kept open the option of raising the Tibet issue—perhaps in the face of Chinese intransigence—in the future. See P. Stobdan, “As China Pushes for a ‘Buddhist’ Globalisation, India Isn’t Making the Most of Its Legacy,” Wire, May 11, 2017, https://thewire.in/diplomacy/india-china-buddhist. 52 Matt Wade, “Narendra Modi’s Yoga Diplomacy, or How India Is Winning Friends and Influencing People,” Sydney Morning Herald, September 9, 2016, https://www.smh.com.au/national/narendra-modis-yoga-diplomacy-or-how-india-is-winning-friends-and-influencing-people-20160909-grcp0u.html. 53 “Buddhist Diplomacy: Stressing Civilisational Linkages, Modi Visits Xuan Zang’s Shrine in China,” Times of India, May 15, 2015, https://timesofindia.indiatimes.com/blogs/toi-editorials/buddhist-diplomacy-stressing-civilisational-linkages-modi-visits-xuan-zangs-shrine-in-china/. 54 Dipanjan Roy Chaudhury, “India Plans Cotton, Ancient Maritime Routes to Counter China’s Ambitions,” Economic Times, April 17, 2015, https://economictimes.indiatimes.com/news/economy/policy/india-plans-cotton-ancient-maritime-routes-to-counter-chinas-ambitions/articleshow/46952190.cms. 55 Ben Lowsen, “China’s Diplomacy Has a Monster in Its Closet,” Diplomat, October 3, 2018, https://thediplomat.com/2018/10/chinas-diplomacy-has-a-monster-in-its-closet/. 56 For the clearest statement linking Indian civilizational ethos and climate change, see Narendra Modi, “In Harmony with Mother Nature,” Hindu, October 4, 2018, https://www.thehindu.com/opinion/op-ed/in-harmony-with-mother-nature/article25115350.ece. 57 India has been noted as a net gainer in the 2015 United Nations Climate Change Conference in Paris, which provides operational content to the principle of “common but differentiated responsibilities.” See Urmi Goswami, “Paris COP21: Recognition of “Common But Differentiated Responsibilities” Key Achievement of India,” Economic Times, December 14, 2015, https://economictimes.indiatimes.com/news/politics-and-nation/paris-cop21-recognition-of-common-butdifferentiated-responsibilities-key-achievement-of-india-/articleshow/50173196.cms. 58 Werner Levi, Free India in Asia (Minneapolis, Minnesota: University of Minnesota Press, 1952), 7–9; Richard M. Fontera, “Anti-Colonialism as a Basic Indian Foreign Policy,” Western Political Quarterly 13, no. 2 (1960): 425. See also Asoka Mehta, “The Political Mind of India,” Foreign Affairs 35, no. 4 (1957): 686. A rare exception is Donald E. Smith, India as a Secular State (Princeton, NJ: Princeton University Press, 1963), 472. 59 Chris Ogden, Hindu Nationalism and the Evolution of Contemporary Indian Security: Portents of Power (Oxford: Oxford University Press, 2014), 68–69. Also see Kanti Bajpai, “Indian Conceptions of Order and Justice: Nehruvian, Gandhian, Hindutva, and Neo-Liberal” in Rosemary Foot, John Gaddis and Andrew Hurrell, eds., Order and Justice in International Relations (Oxford: Oxford University Press, 2003), 248–53; Kanti Bajpai, “Hinduism and Weapons of Mass Destruction: Pacifist, Prudential, and Political” in Sohail Hashmi and Steven P. Lee, eds., Ethics and Weapons of Mass Destruction (New York: Cambridge University Press, 2004), 313; and B. L. Maheshwari, “Foreign Policy of Jan Sangh,” Economic and Political Weekly 3, no. 35 (1968): 1334–1335. 60 Rajesh Basrur, “Modi’s Foreign Policy Fundamentals: a Trajectory Unchanged,” International Affairs 93, no. 1 (2017): 7–26; Abhijnan Rej, “Beyond India’s Quest for a Neoliberal Order,” Washington Quarterly 40, no. 2 (2017): 145–161.